Lately I've needed to pose for various photographs for a few projects I'm involved in. Sometimes it's as easy as picking out my outfit, finding a spot with a great background and good lighting, and things go as planned. A few shots and we've got one I can use. Other times....well, see for yourself! Even Linus wouldn't cooperate! 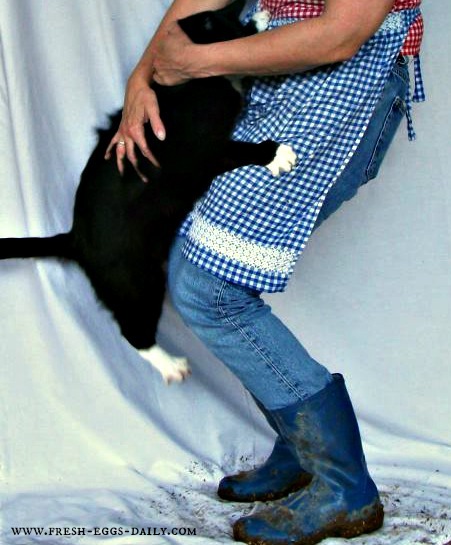 Don't worry though, no animals (or humans) were harmed in this photo shoot! Ducks always go stiff when you pick them up and point a camera at them. I kept telling Sasha here to just 'act natural'....no good. One of my early solo attempts before I realized the background was just as important as the subject of the photograph! Things always seem to go better when there's not a chicken (or a duck or a cat!) involved. Switching to inanimate objects worked a whole lot better! Eggs are just SO well-behaved always. 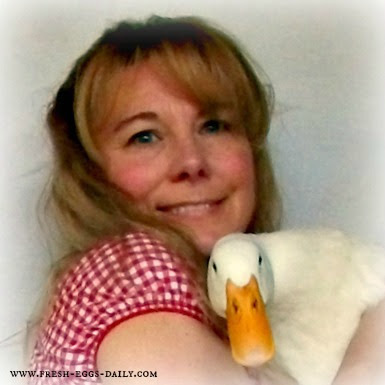 Finally one of the ducks cooperated ! And finally we're done and just 'hanging out'. Join me on Facebook where you can see more outtakes, trail cam 'candid' shots and tons of cute chicks and chickens, plus get advice and tips on raising happy, healthy hens. Thanks for sharing. Those were some photos! Have a great week. You as well. 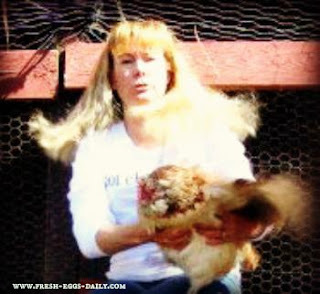 Makes you truly appreciate a perfectly composed photo of someone holding a chicken. I love it!!! Thanks for keeping it real! True farm style. Oh its real around here for sure! Great post and fun pictures! Thank you for sharing!! No sadly they don't. He has a pretty cushy life too, so you would think he would cooperate. Thanks Kristi! I enjoy any time I spend with our animals, so yeah, it was fun and we did manage to get some good shots. I'm most likely not going to have chickens for a long time yet but even these pictures make it hard to wait! I'll be looking you up on facebook too! I imagined something different from the headline, and am relieved that your girls weren't really really bad, just differently active. Oh no they were bad! But finally we got them to cooperate. I just hopped over from Elaine's blog at Sunny Simple Life, and enjoyed seeing your pictures. How funny. I know I never get cooperation from animals, or children for that matter. I think I am really going to enjoy your blog. I'm your newest follower. It's so nice to meet you! I vote the one with you sitting down wearing the hat as the best of the lot. Great smile. Of course we don't see your face in the photo with Linus acting up. Did the smile go away then? Now I feel like I really missed something. I love the apron and boots. I agree about having animals in photos. Ella won't sit still for anything. I like the duck shot. All in all you did get some great photos. Love the photos, great post as always. Oh I just loved these! 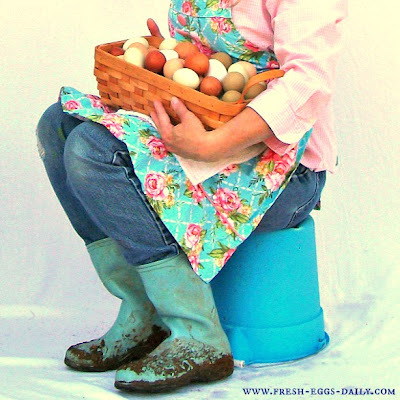 love that basket of eggs (and love those boots). Thank you for sharing. I always enjoy all your animal pics! Haha! These are great! I'd love to hear how you catch your ducks. I raised my from little fluff balls and they still freak out whenever I try to handle them. Lisa, thanks for dropping by What'd You Do This Weekend? Your blog is just what we're looking for. I am a flower lover. The shot with those tulips gives me hope Spring will be here soon. Great pictures. I feel the same way when I am trying to photograph my kids. I am exhausted! They say the hardest thing things to work with are animals and children. Great pictures though. I love live action shots. They're real. Ha ha, loved that you shared this. Great pictures. Have a great weekend.